The Libyan National Army claims airstrikes have destroyed 40 vehicles of the Benghazi Defence Brigades as they approached an oilfield. The helicopter gunship attacks are said to have caught a convoy of BDB vehicles as it approached the Mabruk oilfield. A senior officer in the air force operations room in Benina, where the helicopters are based, said the attack was dedicated to the crewmen who lost their lives on Friday when their Mi-35 crashed near BDB forces. 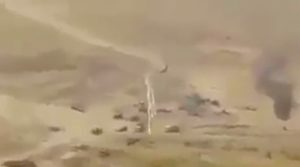 Video of what is said to be today’s attack released by the air force shows a concentrated group of vehicles being rocketed from a gunship. A column of smoke is rising from one of the targets. The footage, shot from a second helicopter, shows relatively low-level attacks going in. The film quality is not good enough to recognise any returning ground fire. It is unclear if the convoy hit today was the same one against which the Mi-35 was flying when it was lost on Friday. That force was said by air force sources to be heading toward the Mabruk oilfield.